After teaming up with TuneCore to unleash the "Heat Seekers" contest, today marks the official launch of the accompanying playlist featuring the first wave of artist spotlights. 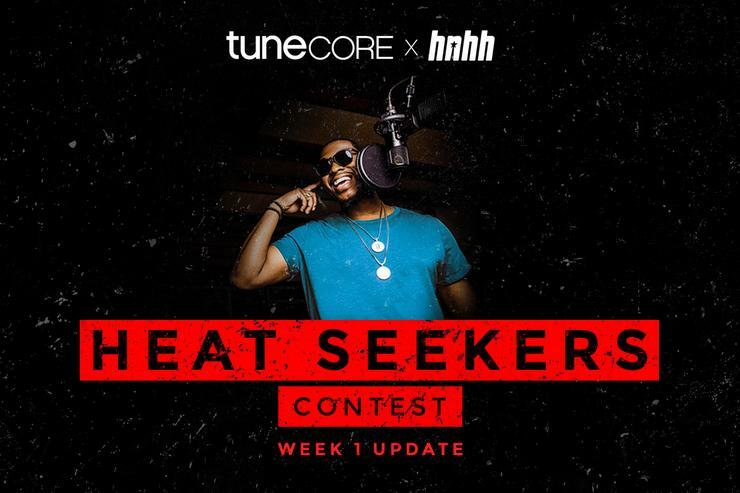 Dedicated to highlighting the diverse and talented TuneCore userbase, "Heat Seekers" proves that there's plenty of unsigned promise working that independent grind, and you could be featured next. Remember, the "Heat Seekers" contest is running until June 7, so be sure to distribute your first project with TuneCore right here! You'll be eligible for the next batch of playlist additions to be posted on HNHH next week. We look forward to hearing what you've got. Keep your eyes on the prize. One artist will also be treated to a studio session with one of the game's hottest producers at the HNHH studio, with the entire experience being filmed and shared on our homepage in June. Submit your music now, and in the sweet afterglow of a job well done, queue up Heat Seekers to scope out the competition. In the meantime, check out some of the artists showcased on this week's playlist launch, including several familiar faces. In essence, it's a showcase of the talented roster you can find on TuneCore, all of whom retain one hundred percent of all profits made from their music. Many independent artists wonder how to get their music on iTunes, Spotify, Apple Music, Tidal, and other stores. The reality is, you don’t have to be signed to a major label – all you need is a digital distributor. We recommend using industry leader TuneCore if you’re looking for a trustworthy and transparent service. For an affordable fee, TuneCore will host your album or single on all the major stores and streaming platforms. You get to keep all your rights and 100% of the sales revenue. Bronx native LightUp has been immersed in the genre for a minute, working as both an artist and an audio engineer. He went on to partner with CreamDaVillain, a Dominican rapper who learned the English language through hip-hop music. When their "Que Lo Que" single started garnering buzz, the pair have since set their sights on a full-fledged takeover. Mir Fontane has been putting in work for a minute, but his subdued banger "Frank Ocean" remains a stellar moment in his catalog. Showcasing his versatility, Fontane has been steadily grinding on the independent circuit, often acting as the curator of his own larger vision. A truly diverse and talented artist, look for big things to come from Mir Fontane in the imminent future. Big Hud commands respect in his circle, and for good reason. Fresh off the drop of his recent "My Boy" single with TrapBoy Freddy, Hud has been putting on in the name of "Big Dawg Johnson," bringing the trap lifestyle to the forefront. Charismatic and authentic, Hud is poised to make a larger impression once his upcoming album drops via TuneCore.